John Vanderslice is a producer, recording studio owner, and master craftsman of intricate, nuanced pop. His music juxtaposes high-gloss production with the kind of emotional immediacy featured in the songs of friend John Darnielle of The Mountain Goats, with whom Vanderslice has produced several records and toured. In advance of his show at Johnny Brenda's tonight, the musical jack-of-all-trades—often billed as “the nicest guy in rock”—got on the phone with The A.V. Club to talk about recording, stealing from one’s own discography, and reinventing himself as a rapper. A.V. Club: In addition to making music, you also run a well-trafficked recording studio. Do you consider the studio as an instrument unto itself? 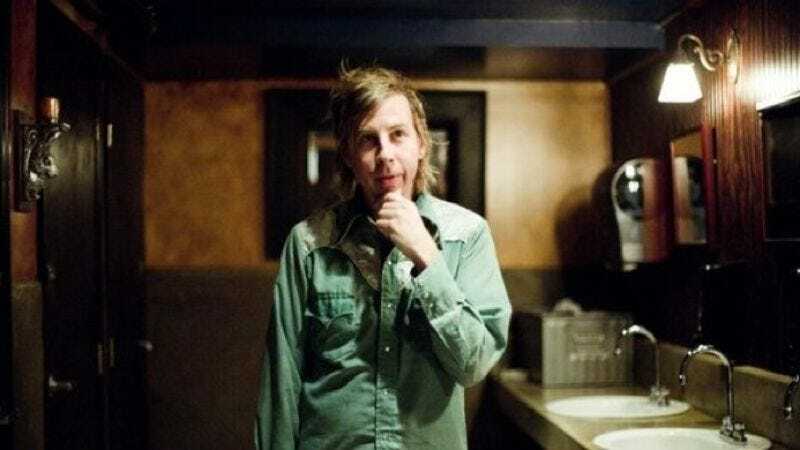 John Vanderslice: Absolutely. I studied voice for six years, and when I started paying attention to Schumann, Weber, Samuel Barber—you know, pretty “out” composers—I realized that indie rock at its most ambitious would never be as harmonically fucked up as this turn-of-the-century stuff was. I realized at that point that I was just going to be another American folkie singer-songwriter. Which is fantastic—there’s nothing wrong with that. But I wanted to satisfy that urge that I had, the experimental and subversive musical urge, and I realized that one thing indie rock has in spades is that it has embraced technology, whether it’s cut and paste or completely reimagining instruments, as Radiohead does, or whether it's subverting the expectations of the listener with ungodly amounts of distortion, like the first Neutral Milk Hotel album. Inspired by all those people and more, I quickly learned that the studio is probably the most impactful thing in the chain. That’s why I started a studio. AVC: You don’t seem afraid to present simple arrangements either. Suddenly It All Went Dark, for example, presents stripped-down versions of your songs from 2005’s Pixel Revolt. Are these kinds of recordings just skeletons, or full entities unto themselves? JV: The drummer in the first band I was in was a very smart guy, and I was bringing in songs and I remember him saying to me, “Hey, try to sit down with an acoustic guitar and just make sure the song works as a song.” That really stayed with me. In some way, it was very freeing. I can make [a song] work on a primary level, harmonically, and from that point anything could happen. When you hear acoustic versions of, say, Pink Floyd songs—you know, stuff that’s highly produced in the studio—you realize how incredibly, elegantly simple the stuff is. It’s kind of the ultimate trick. AVC: When you play live, how committed are you to replicating the elaborate orchestration of the albums? JV: In the beginning, I was much more tied into that. I wanted to represent what happened on the album as much as I could, and after a couple of tours I realized that was total, pure folly. It’s impossible to re-create anything—and to have any connection to the music when you’re trying to recreate everything. I know in the studio that when anything is over-thought, you are really in danger of throwing it away. When I tour with a band, things get more unconscious and more automatic as the tour goes on. Music has to be like natural speech. It's probably like learning a foreign language. Thinking about the use of pronouns is not the passionate part of communicating with people. AVC: So what do you think of acts like No Age—bands that intentionally shirk self-consciousness or make a point of being shambolic? JV: If you’d asked me what I’d wanted to do five years ago, I’d have told you I wanted to be Viktor Vaughn or The Game—I would want to be a rapper with an eightball of coke in my pocket and a wad of hundreds. That kind of freedom—well, perceived freedom—is where I want to be. And that’s probably far away from what I could do. To make a live record—something that has a lot of life in it—is difficult. After slaving away for years in the studio, when I hear a No Age record or when I hear Yeah Yeah Yeahs' first EP or when I hear DRI or really early punk stuff, it’s just so powerful, so raw—and I know how hard that is to create. It’s very deceptive. It’s like a Dardenne brothers film—it seems like just a handheld camera following some people around in a trailer park, but it’s incredibly difficult to do that. AVC: Do you ever go back into your discography and use old songs as models for new ones, or is the process such that each song is built from the ground up? JV: Usually I’m trying to get away from my discography. I don’t think I could tear down everything I’ve done, the structures I’ve created—you know, like what Miles Davis did eight times in a row, which was destroy every kind of crutch or system he had for making music. That’s very, very difficult. When I reflect on my catalog, I’m very proud of it, and I love it, but what I want to do [now] is completely different. When I don’t do something different, I feel like I’m cheating—consciously or unconsciously stealing from myself.